It really is America’s Coolest Small Town. 2nd Friday- Berlin, MD. This morning my husband calls me from work to say that he would like to take me to Berlin, MD. for their 2nd Friday art stroll….um, ok!! My mom sweetly volunteered to watch our son so that we could stroll sans stroller (see what I did there? clever, huh?). As if the beautiful weather, live music, pumpkin pie and amazing art wasn’t enough, I got to see a couple of fellow art friends there too. The Worcester County Arts Council is featuring David Simpson’s beautiful landscape paintings this month. It was so nice to see both David and his new works since we used to be painting friends years ago in college (has it really been over 10 years?!) I have to say that David has an amazing ability to capture light and texture. As a viewer, you can almost breathe the ocean air that he has painted. He also has a friendly, personable demeanor that I find to be rare in the art world. He has stayed true to himself, and the people who know him respect his work. So, if you’re looking to see some absolutely stunning locally inspired paintings this month, head over to Berlin and check him out. You won’t be disappointed. After leaving there we headed over to The Globe Theatre for their photography show, featuring local images of Berlin. I have to say that I was disappointed with this show. It wasn’t that the images were bad. In fact, most of them showed iconic Berlin views that anyone would recognize. What bothered me was the use of all the extra stuff: unnecessary digital editing and cheesy canvas wrapped photos. There were even typed signatures added in photoshop. Ugg. In my opinion, and yes this is probably just my opinion, it would’ve been a much more intriguing show had there been just “plain” ol’ pictures in frames. It’s too bad that something as classic as photography has to be modernized in order for it to be interesting. Down the street at Baked the oil paintings of Sarah Grangier are featured this month. Also a graduate of Salisbury University, she specializes in oil landscapes and wildlife. 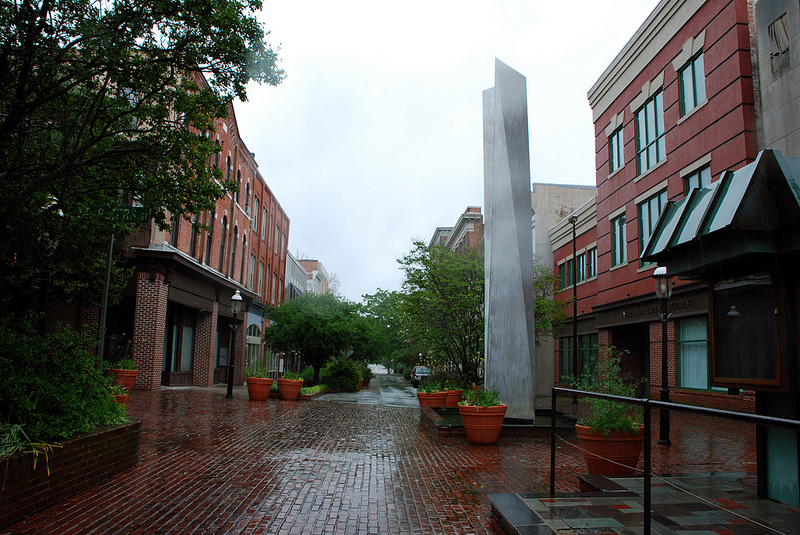 Her work has been featured in many galleries and museums in Maryland. Check her out! And, while you’re there, get a piece if the homemade pumpkin pie. Well, that sums it up. If you’ve never made it to America’s Coolest Small Town for a 2nd Friday, please go. It will be an enjoyable experience, i guarantee it. 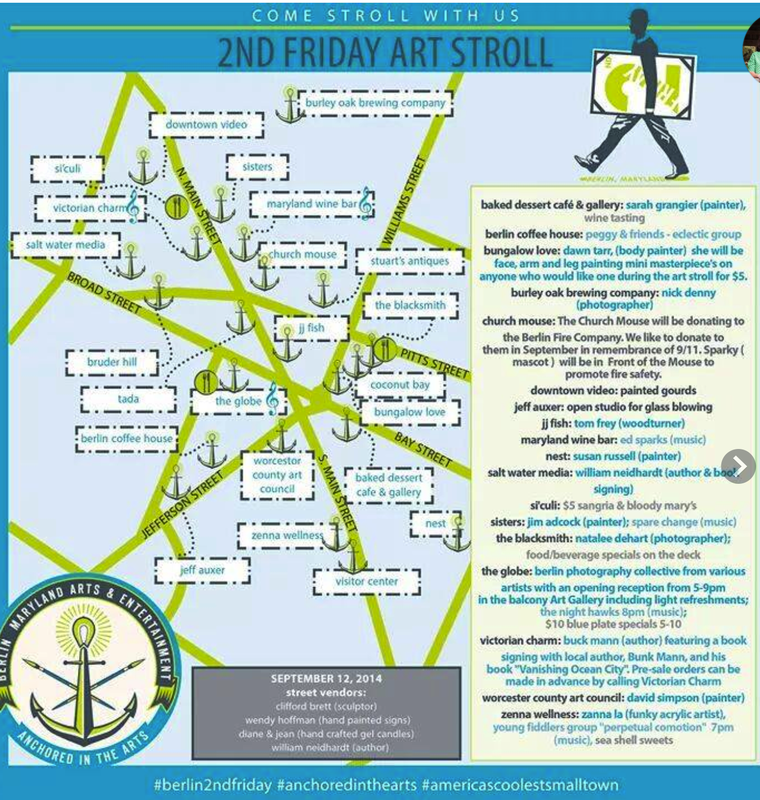 Coming up on September 19th will be 3rd Friday in Salisbury. Each of these events has gotten bigger and better in the last 2 years. A close friend of mine just mentioned that they’ve counted as many as a 1,000 people in attendance over the course of the event. That’s pretty amazing considering that little ol’ Salisbury has a TOTAL population of a little over 31,000. This month I am especially excited to an see an exhibit at the new Tony Weeg Studio & Art Gallery downtown. “Skate Deck Art Show” will be a unique experience in the fine art world. Local artists have been given skate decks, without the wheels, to paint an image on. 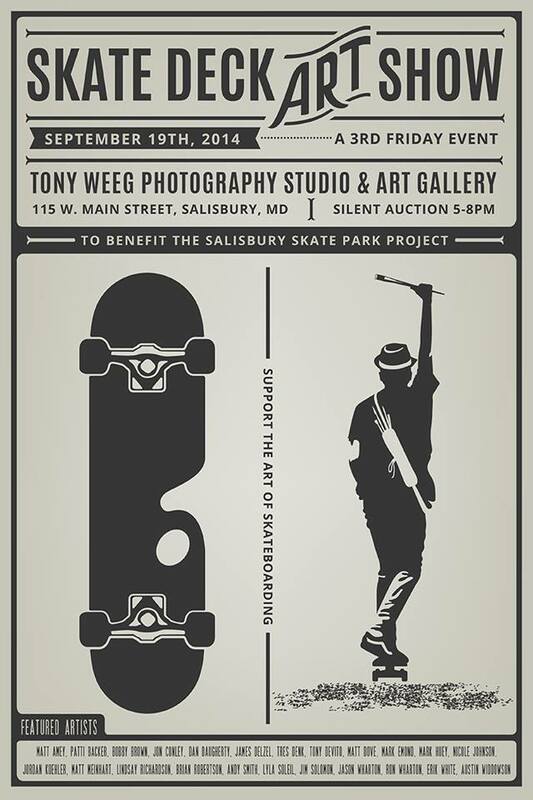 The decks will then be listed in a silent auction, and all sales proceeds will go to the Salisbury Skatepark Project. I love that the artists get a unique medium platform and the town gets some much needed funds. Check out this amazing poster that will be auctioned off as well. My very talented friend Brian Robertson designed it perfectly. You can check out some of his other work here. Brian Robertson’s Poster for the event. It will be really awesome to see what people do with the challenge. I know a few of the contributors, and I can’t wait to see what they come up with.